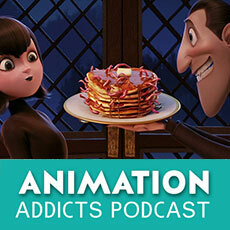 Get ready for the sequel by recapping the original Hotel Transylvania with the Rotoscopers on the latest episode of the Animation Addicts Podcast. World Rabies Day… Are we celebrating rabies? Animation style of Hotel Transylvania: Chuck Jones/Tex Avery… Wait, no live action reference? Universal monsters fiasco: Why isn’t Dracula’s cape red on the inside? Why isn’t Frankenstein green and where are the bolts in the neck? Don’t forget to use the hashtags #AnimAddicts and #AnimAddicts104 when talking about this episode on Twitter!